Happy Halloween! How About Some Pumpkin For Your Little Pumpkin? The recipe is easy. I lightly coat a small sautee pan with butter and add 1 tsp of finely chopped onion or shallot. Add a pinch of cinnamon and cook onions until very soft, about 5 minutes. Add 4-6 ounces of preferably organic canned pumpkin puree (you can make your own puree too, but it’s Halloween and we need some time savers today!). Sautee for a minute or two with the onions and add water to reach your preferred consistency (Ela always likes things on the thinner side). Finally, blend with a stick blender or food mill to create a smooth puree. Questions I often get from parents? Why onion? Why butter? Because they taste GOOD. I agree that we should not be adding lots of “stuff” to baby food, but I think a little bit of these ingredients (yes, butter) gives the food so much taste and dimension. Babies are people too! Serve them interesting meals and they’ll keep exploring and asking for more. The second variation I made was a Pumpkin Sage Puree. I took a fresh sage leaf and sautéed it in the onion/butter mixture for a few seconds. Sage is strong, so just a scent of it will do if you are introducing this spice to baby for the first time. So give a little pumpkin to your pumpkin! Have fun and enjoy tonight. I have to run and get outfits ready (Ana & Elsa, what else?). From Ela’s high chair to your little one’s, BOO! and Bon Appetit! Looks like a tasty treat! 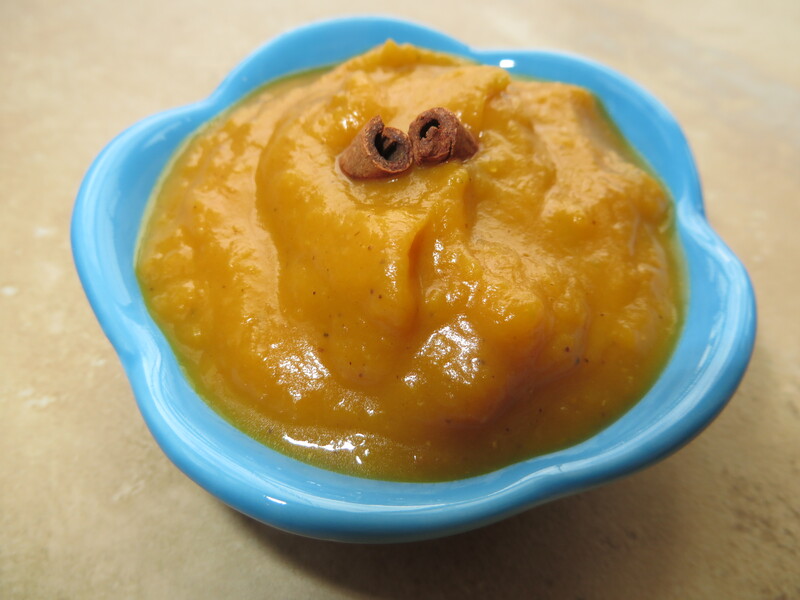 This is the first time I have heard of pumpkin being made into a puree for babies. Nice idea! Stopping over from the Bloggy Moms November link up. Hi Simple Mama! Thanks for the lovely comment and for taking time to visit. I love pumpkin for babies! And pumpkin lattes for me, lol. 🙂 Happy Thanksgiving to you and your family! !